Well there's an app now for the Apple TV, and guess what that's the media player i'm using right now. 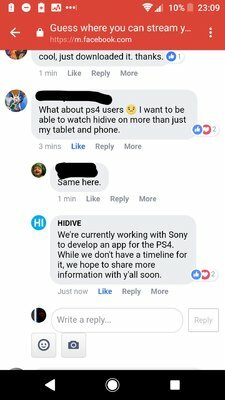 And there's also an Android app so any media player running Android as it's OS (Nvidia Shield for instance) should have access to the HIDIVE app to. I don't have a console, but is there something preventing people from using their console's web browser to navigate to the webpage and watch that way? Or is there an issue with consoles playing the videos like you can't play flash/webms on an iPhone? Genuine question. Page says missing play-in. Same thing with Crunchyroll. Viewster works, but the full screen doesn't seem to work. Funimation, of the dedicated sites does work, the only thing it has over Crunchyroll, but even that suffers the same stutter that the app does! Haven't tried Netflix or Amazon. It seems Pirate sites work fine apart from the pop-ups, it's no-wonder why some people choose that route even when subscriptions are fairly cheap. Anyone else having problems with episode 19 of Hozuki's Coolheadedness 2nd Season not being available to watch? Working perfectly for me, are you in the browser or app? Does anyone else occasionally get Hidive videos cut out and take you to a maintenence page with a stupid video. The homepage redirects straight to it so its the entire site is down as opposed to just the video. I just got that right in the middle of an episode I was watching. Still, I am weirdly drawn in to watching a man in a monkey mask watch The Fuccons for 45 minutes. Been subscribed a few months and still haven't found anything 'new' I want to watch, really only been through the old library. I hope they're still making an effort to get some streaming licenses here as we're still missing plenty. Remember that Hidive didn't have US streaming rights until last month (Amazon had it before that). We're never guaranteed Sentai's disc releases so I hope so. I was also hoping for Squid Girl season 2 which you'd think wouldn't be a huge, it's not s huge IP or anything but nothing from that series is on UK HIDIVE. The English dub of 'Made In Abyss' is coming to HIDIVE on 23rd October. Huzzah, I can finally get some decent use out of my HiDive sub! Same, have an Xbone set up on the main telly. Huzzah, I can finally get some decent use out of my HiDive sub Xbox One!